HIROHISA: Our brew master’s sake. and waiting for the warmth of spring. This is a story we have known for ages. our Harugokoro sake must be passed to the generations that follow. must also handed down across generations of sake brewers. Harugokoro has an exceptional flavor, and only our brewery can make it. Sake brewing is our life. Protecting our brewery means protecting our family, and protecting this flavor. It’s in the DNA of our successors, and the DNA of the microorganisms. Even when those of us alive today are gone, new Harugokoro will still be brewed. 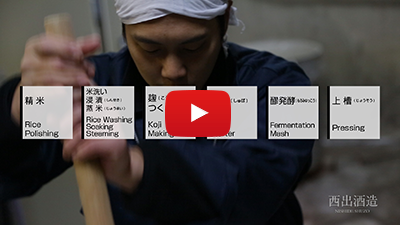 We make sake like a builder who builds a house using only the finest natural woods. Living in harmony with nature. One could even call it natural beauty. Brewed through natural fermentation, suitable for a sake of gods. This sake is infused with our experience and our wishes as sake brewers. with specially developed techniques that show our commitment as brewers. This commitment will be evident to all who enjoy this sake. so we can communicate a feeling that resonates with others. Our inexhaustible curiosity will keep rising. Hirohisa will continue to evolve, and we will continue brewing it. that are the product of technological advancements. Hirohisa sake is like contemporary art that is intricate, bold, and unique. Made with our dedication to choosing the finest yeast and ingredients. We have over a century of history, but we are new at selling sake. we’re still the same small-scale local brewery we have always been. The people may change, but our roots have not. we put our heart into our sake and sell it according to our stature. under the guidance of Naohiko Noguchi, the Noto Toji master brewer. developing a wine-style sake made using malic acid yeast. and returned the brewery to its original name, Nishide Shuzo. ◎ Entrance fee : free ◎ Hours：9:00 AM – 4:00 PM ◎ Closed day：Thursday ◎ Tasting is available for a small charge of 100 yen. ◎ Parking is available, but spaces are limited so please inquire. ◎ For group tours, please make reservations in advance. ◎ Sake is sold at our store or can be shipped locally. Copyright © 2019 西出酒造 All Rights Reserved.